The shot-stopper was in superb form as he saved a penalty and pulled off a number of other fine stops. 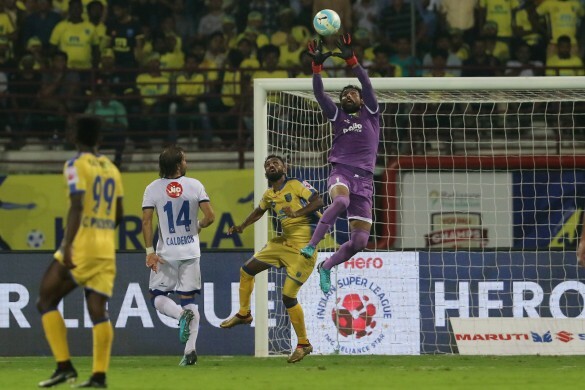 It was a show of the gatekeepers from both the houses as a disciplined yet physical ‘Southern Derby’ of the Indian Super League ended in a goalless draw. Both sides came agonizingly close to scoring in a thrilling game highlighted by a lot of end-to-end stuff. 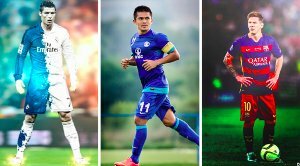 While Kerala Blasters FC now relies on all sorts of mathematical probabilities to reach the knockout, the travelling Chennaiyin side can breathe a sigh of relief as they stand on the brink of qualification. The TFA product performed his defensive responsibilities safely, blocking off dangerous run-ins by Chennai forwards. He also charged in across the opposition half and delivered some vital crosses inside the box which were dealt with safely. It was not the best of performance from the experienced India-international. He looked bit sloppy and lazy at times. However, he made a match-saving effort towards the last minutes of the game putting his body on the line, throwing himself down that possibly denied the ball from ending at the back of the net. The Mizo left-back was on song as he put in a healthy full shift and denied the visitors from creating many opportunities inside his own half. His fair and physical gameplay made Chennaiyin’s attempt down the right flank very limited. Blasters boss David James tried a Milan-Berbo midfield combination and it didn’t disappoint. The midfielder from Manipur was more prominent in resisting a possession dominant Chennaiyin FC as his tackles and interceptions made it difficult for the visitors to break in freely. 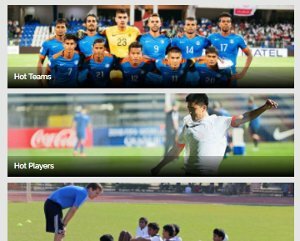 He was replaced by Deependra Negi in the 90th minute. You won’t want to disappoint in front of your home fans. Unfortunately for Vineeth, such was the story setting last night. The Kerala lad had the opportunity to break the deadlock not once but twice but goofed up on both occasions. Clearly, he was nowhere near his personal best and managed only 16 touches in the entire game. An agile customer on the pitch as always, the Manipuri midfielder beat his markers on pace, crept inside the opponent’s half, fired in those odd shots and delivered teasing crosses inside the box. However, the Blasters could not benefit from his efforts and see their playoff hopes fading away. He was brought in to replace the experienced Dimitar Berbatov in the 63rd minute of the game. The 20-year old midfielder had a decent outing and did everything under his belt to ward off the Chennaiyin charge. He replaced Milan Singh in the 90th minute. Did not have much role to play. Probably the talk of the town today after last night’s thrilling but goalless Southern Derby, it was Karanjit Singh’s heroics with his pair of gloves that denied Courage Pekuson to score off a penalty kick and topped them up with a string of fine saves, rightly earning him the ‘Hero of the Match’ honour. 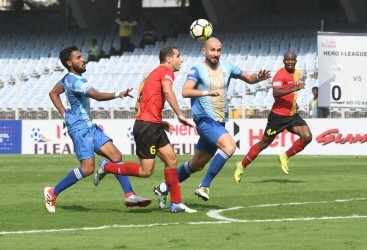 The Goa-born defender was true to his defensive duties, keeping regular checks on the attacking approaches of Gudjon Baldvinsson, Jakichand Singh and others. However, he was stretchered off in the 63rd minute probably due to a hamstring pull and Francisco Fernandes replaced him. The Mizo left back never looked switched off for a second and put in a fine performance last night in Kochi. In the 41st minute he squared off a ball into the box brilliantly but Bikramjit Singh’s first-time shot failed to even hit the target. His rash tackle from behind on Baldvinsson earned the Blasters a penalty but Karanjit Singh covered up for Jerry’s mistake. 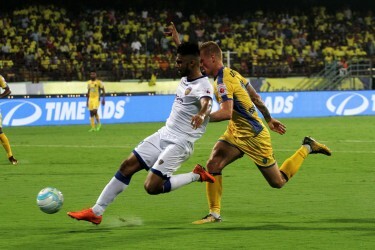 The Chennaiyin FC midfielder was able to contain the Kerala forward line and formed a solid partnership with Dhanpal Ganesh, each backing one another on crucial occasions. He was a bit wayward with his shooting and failed to hit the target couple of times. One of the two midfield mainstays for Chennaiyin, he helped his side earn a point from a gruelling encounter last night. His well-timed headed clearance denied Dimitar Berbatov to break the deadlock in the 31st minute. Jeje looked more promising last night compared to his previous couple of games. Though he saw enough of the ball, he could not deposit a Rene Mihelic-pass in the back of the net just before the first period; the shot is hit very wide and coach John Gregory wore a frustrated look in the technical area. Brought on as a replacement for Keenan Almeida. Put in a tidy effort on the pitch. Replaced Jeje in the 83rd minute as John Gregory tried to breach the Kerala defence. Did not have much of an impact on the game.